Three Rooms Press, 9781941110423, 356pp. 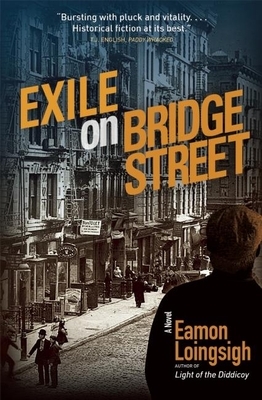 Exile on Bridge Street details teenage Irish immigrant Liam Garrity's struggle to adulthood in pre-Prohibition Brooklyn. Back home, Ireland's fight for its own independence erupts with the 1916 Easter Rising. The fate of Garrity's father, an Irish rebel, is unknown, which leaves his mother and two sisters vulnerable on the family farm as British troops swarm, seeking reprisals. Garrity must organize their departure to New York immediately. In Brooklyn, Garrity is adopted by Dinny Meehan, leader of a longshoremen gang based in an "Irishtown" saloon under the Manhattan and Brooklyn bridges. Meehan vows to help Garrity and his family. But just as Ireland struggles for independence, Garrity faces great obstacles in his own coming of age on the violent Brooklyn waterfront. World War I, the Spanish Influenza, the temperance movement, the rise of Italian organized crime, police, unions and shipping and dock companies all target the Brooklyn Irish gang and threaten Garrity's chances at bringing his family to New York. When "Wild Bill" Lovett, one of the gang's dockbosses vies to take over, both Meehan and Garrity face a fight for survival in New York City's brawling streets mirroring Ireland's own fledgling independence movement. Compelling writing by a master of historical fiction, as evidenced in the author's critically-acclaimed prequel Light of the Diddicoy. Journalist/novelist Eamon Loingsigh has long held a great fascination for the history of Irish-Americans in New York City. His family emigrated from Ireland in the late nineteenth century, and his grandfather and great-grandfather ran a longshoreman s saloon on Hudson Street in Manhattan from 1906 to the late 1970s. Loingsigh studied journalism at University of South Florida. He is the author of the novel Light of the Diddicoy (Volume I of the Auld Irishtown trilogy), Exile on Bridge Street (Volume II of the Auld Irishtown trilogy), the novella An Affair of Concoctions and the poetry collection, Love and Maladies, as well as numerous articles on Irish-American history. He lives in Brooklyn."